Summary: A girl and her dog go for a walk through the fields and forests on a late summer day. As they go, she greets everything she sees: “Hello, trees. Hello walking sticks and butterflies. Hello, puddles.” Each item responds to tell her how it is changing as summer turns into fall. The trees are swaying in the breeze, the animals are looking for food, and the sun is setting earlier each evening. After watching it set, the girl says goodbye to summer and goes into her house. A wordless two-page spread shows a peaceful nighttime scene. 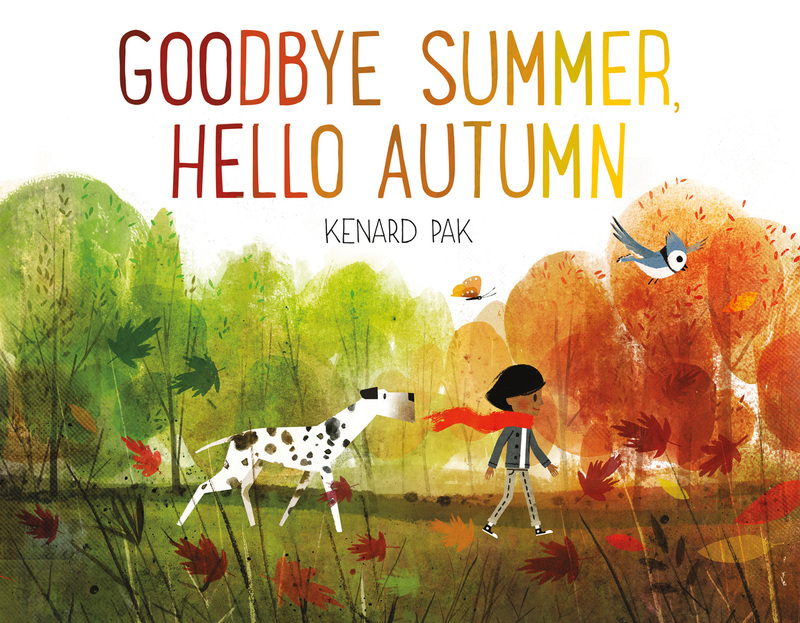 On the final page, the girl sits on her front step, the sun back in the sky, and greets the new season: “Hello, autumn!” 32 pages, ages 4-7. Pros: Perfect for this time of year, the text and the beautiful green and gold illustrations will get kids talking about the changes they see around them as summer moves into fall. Cons: That twinge of sadness I feel as the days shorten and the leaves start to change colors.